The sign reads “Tallgrass Prairie National Preserve,” so where’s the tall grass? Visitors to the preserve ask this question many times throughout the day. The answer: The 10,894 acres of tallgrass prairie exists at a variety of heights – it takes Mother Nature a full season to grow grasses to their fullest height. Think of it as being “tall in the fall.” It takes time. It also takes time to appreciate the subtle beauty that is the Flint Hills and the tallgrass prairie. 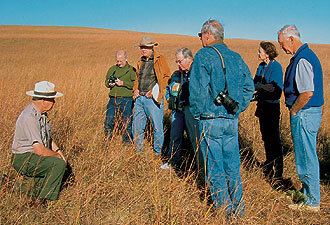 Today, less than 4 percent remains of the once vast 140 million acres of tallgrass prairie. What happened to all this grass? The Great Plains were once considered the “Great American Desert” for the lack of forests and vast visual expanse of horizon – much like that of desert landscapes. As wagon trains crossed the plains heading west, people learned that the “Great American Desert” had, in fact, very rich soils. Once the richness of productivity was widely understood, within a generation the plains were forever altered. Settlers plowed the soil, and the prairie was forever changed. Why is some of the tallgrass ecosystem still intact? Simply stated – it’s because of the area’s geology. The shallow, rocky underbelly of the Flint Hills saved it from the plow. Opportunities for you to experience a tallgrass prairie with its flora and fauna and to learn about Flint Hills’ geology, ranching legacy, and American Indian culture abound. 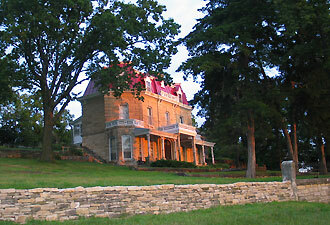 The preserve has more than 40 miles of hiking trails and offers daily tours with National Park Rangers of the prairie by bus and of the 1881, 11-room, Second Empire limestone ranch house. A 14-head genetically pure bison herd, including its first baby born May 9, 2010, now grazes the preserve after an absence of more than 140 years. During the summer months you can view grazing cattle and tour the massive limestone barn with its third- story wagon on and off ramps –who knew barns needed express lanes? There is a chicken house that is large as some small apartments. Other historic buildings include an outhouse, icehouse, and curing house. There is even a little limestone one-room schoolhouse, the Lower Fox Creek School, where you can experience a real prairie education. 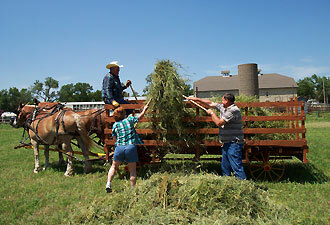 Come to participate in the special events and living history activities throughout the year. A very hands-on Junior Ranger Station allows kids to be kids. In their quest to become Junior Rangers, kids measure themselves against grasses, create animal tracks, and touch fossils, birds’ nests, and other cool things. A Leave No Trace scavenger hunt is also available. There is simply something for everyone. We are confident that you’ll leave amazed by not only the friendly and knowledgeable staff and wonderful programs and activities at the preserve, but also by the sheer beauty and peaceful nature of the tallgrass prairie. Tallgrass Prairie National Preserve is located 16 miles west of Emporia, Kansas on U.S. Highway 50 and 2 miles north on the Flint Hills National Scenic Byway (K-177). Please call (620) 273-8494 or visit www.nps.gov/tapr for more information.